More robots, more machines, mean more job displacement, more unemployment? Uhmm, No. New industries always create new jobs, despite their initial job-displacing effect. For instance, when telegrams were replaced by paging devices, then by SMS and mobile phones, those who were displaced in the telegram industry did not go hungry, they simply changed jobs to higher skills category. More robots, more machines mean more demand for people to manufacture, assemble, repair and upgrade bots and machines. Cars, trucks, robots, other machines, they can also get "sick", and humans come in. Look around, there are few manual laundrymen and women, instead there are more washing and drying machines. There are more dishwashing machines in restos, car washing machines. In agriculture, there are more rice harvesting and threshing machines, rice drying machines, etc. And unemployment rate in many countries is falling. Why? Because increase in productivity by people give them more income, more savings, and they purchase more things that they could only dream before. And this creates new demands, new production, new industries. Before, very few people could afford to buy mobile phones, much less the "high tech" smart phones. As people used more machines, from agri to manufacturing to services, their productivity and income increased, they can afford to buy more mobile phones. From 1 M to 10 M to 100 M or more mobile phones in just one country, the demand for labor to (a) manufacture and assemble, (b) transport, market and sell, (c) repair and upgrade mobile phones, has significantly increased. If people have low productivity because they do manual work all the time, their income is low. With more machines, people's productivity greatly increases. If they are poor, they can only afford the $0.10-30 coffee sachets in stores. If they are wealthier, they can afford the $2 coffee in fancy coffee and bake shops. And this creates/expands employment in new industries, like those fancy coffee shops, restos and bars. 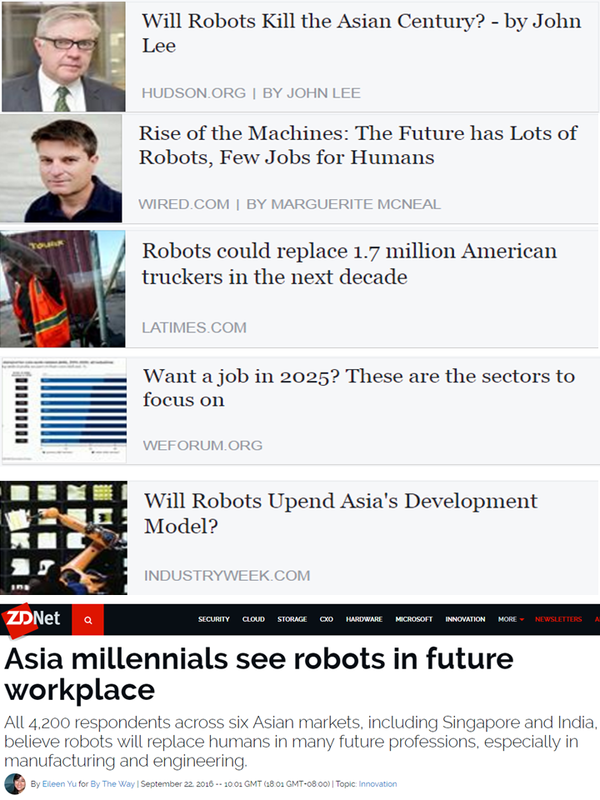 Lesson: more machines, more jobs creation. My car is old, so it goes to a repair shop often. My mechanic before works alone, no assistant, why -- because he has all the machines he needs. He does not slip on the floor to check what's wrong with the arms and bolts under the engine or beside the tires, he has 2 car lifters. He can check the engine and other moving parts from top to bottom while standing. He earns big of course, both from the shop owner and from tips of customers. What does he do with his higher income? He spends more, he buys things that he could not buy before. More industries are created to supply his new needs and those of other people with higher productivity, higher income. I went to Malaysia 2x last year, I was surprised that KLIA now is highly mechanized, people just go to the counters to drop their check in baggage, otherwise they just enter the airport and head straight to the immigration area, then departure lounge. Does this displace airport workers? Temporarily yes, but faster and efficient check in also attracts more foreign visitors, and so more jobs in the tourism sector (hotels, tours, restos, bars, etc.) will be created. I think for every 1.7 M jobs/truckers to be replaced by self-driving trucks, there will be 1.7 to 2 M new jobs in the robots/machines manufacturing, transport, marketing/selling, repair, upgrades industries. Plus more restos, coffee shops, bake shops, hotels, etc. as people spend more from their higher income. What can kill jobs are not machines and robots (they expand jobs actually), but govt heavy regulations of wages and benefits. Like mandatory high minimum wage. This alarmism and negativism about the role of more robots, more machines in our lives, are supportive of the "inequality is wrong/evil" mantra. Only competitive capitalism and the free market system are capable of endless innovation, mechanization and robotics/tech modernization because the goal is to mass produce many things: mobile phones, shoes, clothes, cars, flat tv, etc. Let the robots and machines produce those things 24/7, no weekends and holidays if necessary -- like the airlines, hotels, bus lines, etc. The people who operate those robots and machines are paid 5x, 10x, 30x the minimum wage, these "workers" can be richer than any small-time capitalists around. * This is my article in BusinessWorld last August 25, 2016. Private property and its protection is among the cornerstones of a free society. It bestows upon the individuals, households and enterprises exclusive rights what to do with their private property like a car or a piece of land -- use it, sell it, rent it out, or donate it. When private property rights are unprotected, society can quickly degenerate into chaos and disorder. Gangs and bullies can confiscate other people’s houses, cars, or shops, and the enterprising people will flee and escape such society and only the lazy, bullies, and opportunists will stay. Measuring property rights protection across many countries has been done by the Property Rights Alliance (PRA), a Washington DC-based think tank. It produces the International Property Rights Index (IPRI) annual reports and partners with independent, nongovernment and market-oriented think tanks and institutes from many countries around the world in spreading the philosophy and measurement of protecting private property rights. The IPRI 2016 Report was released in partnership with 102 independent think tanks from 70 countries and it was launched on Aug. 10, 2016 in Delhi, India. (1) Legal and Political Environment (LP), which covers judicial independence, rule of law, control of corruption and political stability of a country or economy. (2) Physical Property Rights (PPR), which includes registration and protection of physical properties, access to loans. (3) Intellectual Property Rights (IPR), that includes IPR protection, especially patents and copyrights. Thus, countries with high scores in two or all three of these areas will have a high IPRI overall score and global rank. Below are the scores and global rank of ASEAN (Association of Southeast Asian Nations) countries and their neighbors in the region. Three ASEAN countries -- Brunei, Cambodia, and Laos -- were not included in the IPRI annual reports, mainly for lack of reliable data for comparative purposes. Myanmar was included only starting 2015. 1. 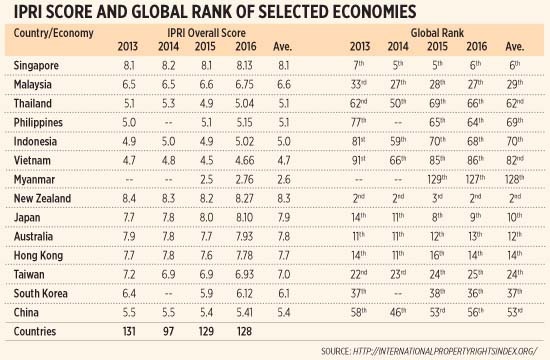 The more developed the economy is (Singapore, New Zealand, Japan,...), the higher the IPRI score and global rank. Which implies that as private property is better recognized and protected, there are more economic activities that occur. 2. Emerging markets of the ASEAN except Thailand have improving global rankings: Malaysia, Philippines, Indonesia and Vietnam. The decline in Thailand’s ranking coincided with the rise of the military leadership there. 3. The Philippines experienced the biggest improvement among the emerging markets in the region, from 77th in 2013 it rose to 64th in 2016. Its overall score of 5.15 in 2016 is a result of its low score in LP of only 4.15 but compensated by its high score of 6.07 in PPR, while its IPR score in IPR was a modest 5.23. The continuing uncertainties in human rights protection due to the ongoing extrajudicial killings (EJKs) related to the drugs war of the Duterte administration may have some negative repercussion in the country’s future low scores and position in rule of law and judicial independence. These two are part of the Legal and Political environment (LP). There is danger of a possible decline in the Philippines’ overall IPRI score and global rank if these uncertainties continue for long. The main functions, the raison d’etre or reason for existence of governments are to enforce the rule of law, to protect the citizens’ right to life (against aggressors, murderers, rapists, etc. ), right to private property (against thieves and destroyers of properties), and right to liberty (against censorship, bullies and despots). Private property rights as human rights are good incentives for the people to become productive citizens and stay away from being dependent on state welfare. Governments should stay the course in securing this philosophy and veer away from forcing equality by penalizing the hard working with high, multiple taxes, fees and permits. I am reposting this post last Tuesday by a friend, Bernard Ong. It has gone viral, shared nearly 6k since more than two days ago. Keep writing this kind of analysis, bai. Thank you. Updating my May 2016 post on Hugo Chavez. Very important lessons for the Philippines today. The photo collage shows 3 things: An emergency room in Venezuela - hospitals have broken down to the point that there are shortages of basics like soap, gloves & medicine. A nursery where babies are kept in boxes. And the man who started it all – who crossed his Rubicon, the “point of no return”, and dragged his country into the abyss. In 1998, Hugo Chavez was elected president of Venezuela. 1. He promised “order" and a "strong hand to fight crime & corruption"
6. He waged war against "oligarchs" declaring "being rich is bad"
10. He allowed China to take over large areas of the economy. Sounds familiar? 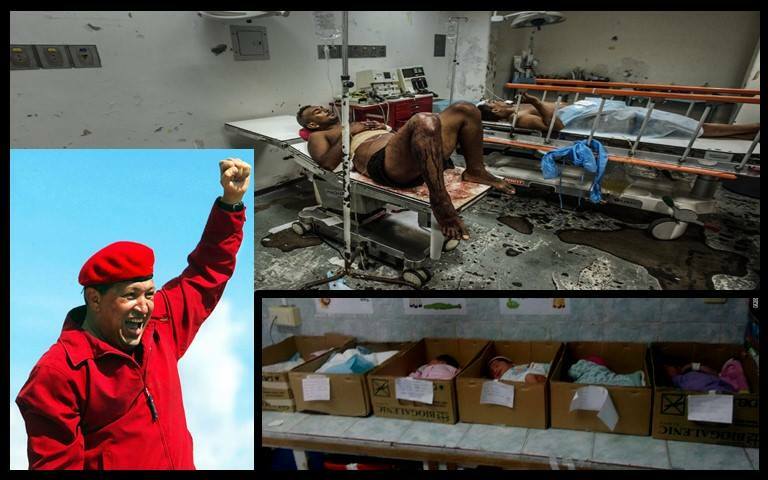 Not a coincidence, Hugo Chavez is the template for modern-day socialist dictator wannabes. Chavez stayed long in power, getting reelected several times & even coming back after being ousted by a coup. Venezuela was a major oil exporter & oil prices were high. Oil profits bankrolled his social welfare programs to buy popular support. He died in office in 2013. Despite huge oil bonanza, Chavez mismanaged the economy. 1. He imposed currency controls to prevent capital flight. - This policy prevented companies from buying equipment, supplies & raw materials, eventually leading to shortages in production. 2. He imposed price controls – This policy drove local suppliers stop producing just as imports were scarce due to currency controls. This led to shortages & inflation. 3. His government spent far more than it could afford – This policy caused Venezuela to run huge fiscal deficits & incur heavy debts when oil prices collapsed from $120+ per barrel in 1998 to $60 in 2015. Basically, Chavez didn’t know math & couldn’t care less about policy. In his mind, he was always correct & it was the world’s responsibility to adjust reality to his view. Today Venezuela has completely collapsed. There are shortages of everything – energy, gasoline, food, medicines. There is rationing & widespread looting. Crime is far worse. Consumers line up to wait for food from 4am. Those who buy “too much food” are arrested on grounds of violating laws against interfering with the production, transportation or sale of food. Pets like dogs & cats are let go by owners, because it is costly to feed them. Those are the lucky ones. The unlucky ones become meals to feed hungry humans. Inflation was 150% in 2015, estimated at 481% in 2016, and 1642% in 2017. In Philippine terms, your one peso today will be worth 6 centavos in 2017. Tough labor laws make it impossible for business to fire workers. It doesn’t matter anyway as workers’ wages are unable to keep up with inflation - they provide cheap underpaid labor. GDP is forecast to decline 10% in 2016. There is massive unemployment. 75% of the population live in poverty. And corruption? The richest Venezuelan today is reported to be Maria Gabriela Chavez, Hugo's daughter with $4.2 billion stashed overseas. She ignored daddy's "being rich is bad" dogma. Smart hija did not cross the socialist Rubicon. Who does Venezuela blame for this policy-induced disaster? President Maduro – the successor of Chavez – blames the mess on a “conspiracy” by the United States. We've seen his type here at home before. Marcos' 14-year dictatorship – hyped to fight communism & restore order – ended up sucking the Philippine economy dry & led to world-record plunder by the Marcos family. He too crossed his Rubicon when he imposed Martial Law & plunged the country into darkness. The next time a leader says he is crossing his Rubicon, do your homework – check the policy implications, do the math, think steps & years ahead. If it does not make sense, step back from the abyss. Your country will need you to help clean up the mess after the disaster. This bad tax measure has been proposed by the DOF and some legislators many years ago but never succeeded. This time, it looks different as the new Duterte government is hell-bent on having this become a law within the year or next year. "The excise tax adjustment will entail, in the case of regular fuel, raising the levy from P4.35 a liter at present to P10 a liter next year, P10.40 a liter in 2018 and further to P12.17 a liter by 2022. For diesel, from zero at present, an excise tax of P6 a liter would be slapped next year, P6.24 a liter in 2018, until it goes up to P7.30 a liter by 2022." Bad. Very bad. But can be acceptable if personal income tax rates will be slashed to 20% max, better if 15% max. Otherwise, bad. Very bad. This government can be bad if such huge tax hike in petroleum products is not compensated by huge income tax cut. Last July 12, 2016 during the first BusinessWorld Economic Forum, among Sec. Dominguez's proposals was a zero income tax for those earning P1 M/year or less, which is very good. Things have changed in just two months. It is misleading for the DOF to say that only the top 10% of the population are the biggest consumers of gasoline. The most affected will be the small and micro entrepreneurs who can not easily raise prices because of the competitive environment. 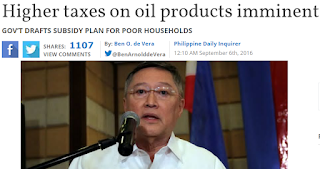 The only mitigating or compensating measure here would be a huge income tax cut, so that people will have more money in their pockets that they must shell out back to government in the form of higher consumption taxes like excise tax for gasoline and diesel. Imagine, from zero to P6/liter. Very parasitic thinking by government. And obviously inspired or pushed by the WB, IMF, ADB, other foreign aid. Now, the DOF proposed income tax cut is small. more than P5 million, P1.45 million plus 35 percent of the excess over P5 million. From 7 to 6 tiers. What Sec. Dominguez did here is to retain the 32% for those earning P2M to P5M, then 35% above P5M. Pakonswelo for those earning below P2M a year, they will pay only P132,500 + 30% of the excess over P0.8M. It is very parasitic to claim that petroleum products are "public bads" that must be taxed as high as possible to have a "clean environment". NO. Petrol products are public goods, without them, there will be massive poverty, massive underdevelopment, massive hunger in this country. People want to walk or ride bicycles or horses/cows over long distance because cars, buses, trucks, jeeps that use petrol products will be limited or curtailed? Huge volume of animal manure on the roads alone will make our environment dirty, foul and ugly. If fisherfolks will use manual paddle of their fishing boats, if farmers will use carabaos or cows instead of faster and stronger tractors in tilling their farms, or harvesting and threshing their harvest, see the negative impact of very low agri and fishery productivity. "I'm all for this, our petroleum taxes are among the lowest among importing countries. I'd split the tax so that you can incentivize certain behavior. Higher taxes for fuel but a lower category similar to the current jeepney diesel subsidy to public transport (commercial passenger and trucks) , for private vehicles keep the higher tax category. In the long run you want to disincentivize individual car use as this makes livable cities difficult. This goes hand in hand with many other urban planning tools, like zoning, parking subsidies etc. Besides even with a Php 7 and Php12 tax, this is still lower than a few years ago so the economy can take it." The low oil prices were important contributor for very low inflation rates in the PH in the last 2-3 years. Bringing back gas prices to near P50 or near P60 a liter, and diesel to near P40 a liter, will automatically push overall inflation rate to higher levels. And more poor people will complain. Then govt will say, "we need to raise further oil taxes to finance more subsidies to the poor." Vicious cycle. If petrol taxes will rise at high levels, more people will buy motorcycles, or small cars with low oil consumption per kilometer, and the same traffic congestion we will experience. Meanwhile, the cost of transpo of rice, vegetable and fruit dealers, fish and meat dealers, both in trucks and boats, will rise. Which means they will pass the additional cost to the consumers. Petroleum is a public good, not public bad. Peter added, "actually all we've learned from centuries of urban planning and learning how cities work show that this blunt initiative is effective in curtailing car use. It would work even better if, as I mentioned in my comment to Butch , we add more taxes on cars , parking ( add taxes and take out the inherent subsidies) and do congestion pricing. On a world wide level where cities have done this,it works. As for the inflationary aspect, take note that I'm for expanding the current subsidy on public transport, that includes any sort of regulated transportation that has a certificate of public convenience. We already have this with the jeeps, so expand this to buses, cargo trucks, taxis etc. So that the public good aspect is not affected. 80% of vehicles on the road is taken by 20% of the private vehicle owning public, we need to reverse this . If we take a look at the most succesfull capital cities private car use is but maybe 10%. This at least give the car owner a choice, to use public transport however ineffcient or pay a bit more. Add in all the other measures we'll surely have a more livable city." Another reason why I want the PH to disintegrate into many countries. A central government will always impose a one size fits all policy. Whether a province or island has efficient mass public transport or not, the policy applies uniformly. The Manila-based government thinks that taking out more cars, motorcycles, buses from the roads to be replaced by trains (even if the infra in many areas are not there yet) will also apply to island-provinces like Masbate, Catanduanes, Bohol, Romblon, Camiguin, Biliran, Guimaras, Basilan, etc. For these islands, reliance on petroleum is very high, they cannot bike or run or ride a bus from their province to the next. They must ride a boat, then take a tricycle or jeep or bus to their destination. A rise in petrol prices by at least P6/liter will significantly affect their mobility, the cost of their goods and services traded across islands. Instead of raising the excise tax for gasoline and imposing the tax on diesel, the government should do the opposite -- remove or drastically reduce the tax for gas, retain the zero excise tax for diesel. This will help reduce inflationary pressures. Government should learn to cut its spending, not the people's take home pay. * This is my article in BusinessWorld last August 18, 2016. A declining share of agriculture gross value added (GVA) in GDP (gross domestic product) is often viewed negatively by many sectors because it implies that a country is not prioritizing rural development and job creation. Is this a valid observation? Let us review some agriculture data of the Philippines and compare them to its neighbors in the ASEAN and then we tackle that question in the latter part of the paper (see Table 1). The numbers above tell us the following. 1. In terms of land area devoted to agricultural crops, Thailand and the Philippines are the most agriculture-oriented in the ASEAN. Singapore is obviously the least agriculture-oriented. 2. In land area devoted to forest, the Philippines and Singapore have the smallest forests in square kilometers. This is despite the increase in the Philippines from 22% in 1990 to 25.4% in 2013. Laos, Brunei, and Malaysia lead in this category. 3. In terms of deforestation (conversion from forest to non-forest land uses), the highest or fastest rate from 1990 to 2013 was experienced in Cambodia, which declined by 18%; Indonesia and Myanmar, which both declined by 14%. Still, their respective forest covers remain high. 4. Those that experienced an increase in both agriculture and forest as percent of land area from 1990 to 2013 are Thailand, Vietnam, and the Philippines. Laos too, though at low rate. One possible explanation for this would be a double counting in the case of agro-forestry plantations. The Department or Ministry of Agriculture would count them as agricultural lands while the Department or Ministry of Environment/Forestry would count them as forest lands. 5. 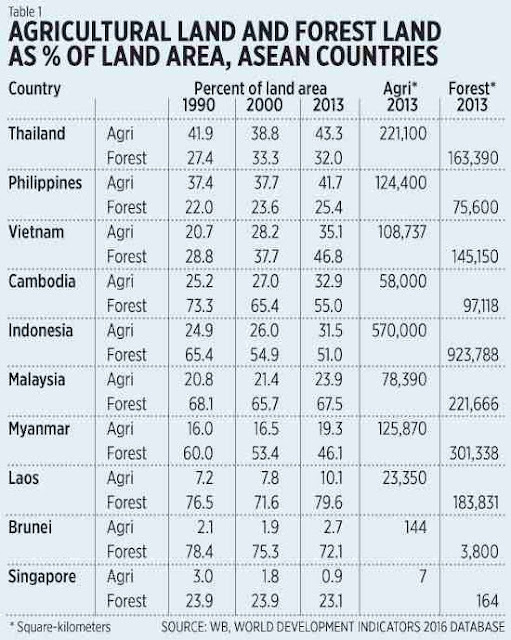 Those that have big potential for more agriculture land expansion are Laos (only 10% in 2013) and Myanmar. Becoming big rice exporters like Thailand and Vietnam will be a big possibility for these two countries (see Table 2). The above numbers tell us the following. 1. In terms of agriculture GVA per worker, Brunei and Singapore are the highest, their huge wealth allows them to employ high technology farming per hectare of land in the region. The Philippines is on a similar level as Indonesia and Thailand while the lowest, surprisingly, is not Laos or Cambodia but Vietnam. 2. Agriculture GVA as percent of GDP, Cambodia, Laos and Vietnam are the highest and the Philippines is again on similar level as Thailand and Indonesia. 3. Notice how the Philippines has reduced this ratio for more than two decades by one half, from 22% in 1990 to only 11.3% in 2013. 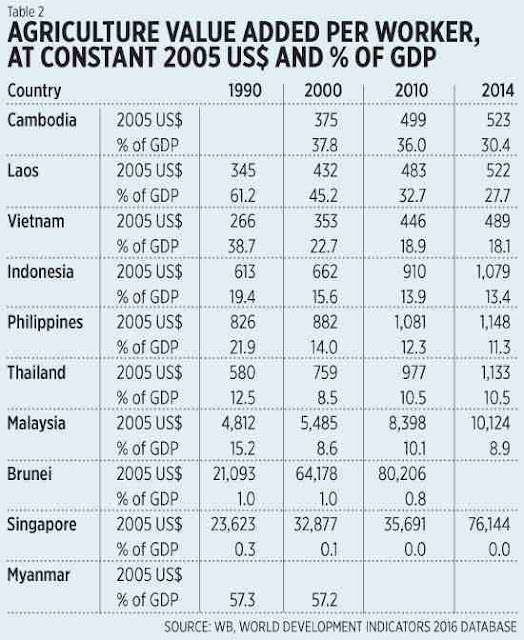 Laos and Vietnam also made this fast transition of reducing the share of agriculture to GDP. So, is a declining share of Agriculture/GDP bad for the economy in general and rural folks in particular? No. The cases of our more developed neighbors Singapore, Malaysia and Thailand, as well as other rich East Asians like Japan, South Korea, Hong Kong, and Taiwan show that this is the trend that they exactly experienced. This means that while agriculture is growing, the industry and services sectors are growing much faster and hence the denominator, overall GDP size, is growing faster too. The services sector is important because it is the forward linkage of both agriculture and industry. Producing lots of vegetables, fruits, chicken, rice, fishery, and cattle products will be limited and compromised if there are not many restaurants, supermarkets, public markets, talipapa, carinderia, litson manok and related outlets -- all of which are in the services sector. Proposals therefore to pour more public resources and tax money to the farmers like free or highly subsidized tractors, machine harvesters, seeds, irrigation, rice subsidy via the NFA, etc. to “correct past negligence” of agriculture may not be always correct. Important players in the industry and services sectors like big food manufacturers, big supermarket chains, big restaurant chains, rice traders, etc. extend various technological, financial, and market assistance to their contract growing partner farmers to ensure high output and lower post-harvest losses. Government support to agriculture should be limited therefore to basic infrastructure like modern farm to market roads and bridges, seaports for quicker delivery of bulk produce from big islands like Mindanao, Panay, and Mindoro. And more dams and big water impounding projects mainly for (a) controlling fast flood during heavy rains, impound the water, and (b) irrigation when the rainy season has subsided or ended. The Philippine Electricity Market Corp. (PEMC) replied to my article in BWorld, Brownouts, coal power and electricity market, August 17, 2016, below. Dear Editor: We are writing in reference to a column written by Mr. Bienvenido Oplas published on 17 August 2016 entitled, "Brownouts, coal power and the electricity market". corporation, can we expect PEMC to be more independent, more candid, in assessing the harm, actual and potential of more REs in the WESM and grid stability?" grid. In contrast to the Australian structure, PEMC acts only as the Market Operator responsible for the governance and operations of the WESM. The function of maintaining the security, reliability and integrity of the power grid is lodged with the System Operator. Against this context, it is grossly inaccurate to claim that PEMC is expected to study the impact of influx of RE resources in the grid. the actual generation of FIT-qualified resources in the WESM as a result of priority dispatch accorded by Republic Act No. 9513 otherwise known as the RE Act of 2008. The MOE of the possible lowering of energy prices in the electricity bourse is no form of endorsement of RE resources on PEMC's part. In the study, the impact of MOE on the market affects only those distribution utilities and directly-connected customers that purchased from the market and does not necessarily translate to the direct lowering of retail rates for end-users because of the FIT. The initiative of PEMC in conducting studies and analyses affecting market outcomes is without partiality to any resource. We understand and appreciate your pursuit of balanced reporting and as such, we deemed it necessary to address the assertions made in your column. In the interest of unbiased journalism, we request that you allow us to air our side by publishing this letter in your paper, as is and sans comment. The Philippine Electricity Market Corporation (PEMC) is a non-stock, non-profit corporation which was incorporated in November 2003 upon the initiative of the Department of Energy (DOE) with representatives from the various sectors of the electric power industry to be the governance arm of the Wholesale Electricity Spot Market (WESM). The WESM began Commercial Operations in Luzon in June 2006 and in the Visa yas in December 2010. In June 2013, PEMC launched and integrated the Retail Competition and Open Access (RCOA) into the WESM. The WESM is a centralized venue for buyers and sellers to trade electricity as a commodity where its prices are based on actual use (demand) and availability (supply). The WESM was created by Republic Act 9136, the Electric Power Industry Reform Act (EPIRA) of 2001. This provided for the establishment of an electricity market that reflects the actual cost of electricity and lowers its price through more efficient production through competition.